Joe Allen swaps the terraces for centre stage on Monday spurred on by a Swansea City cult hero who will be sitting in the Wembley stands. Allen first experienced football's emotional rollercoaster on a dramatic final day of the 2003 season. As a 13-year-old Swans fan, he watched from his Vetch Field seat as his beloved team were 90 minutes from non-league oblivion and possible extinction. James Thomas, too, is a Swansea supporter but his contribution on that unforgettable May day transformed the local lad into a cult hero as his hat-trick against Hull capped an ultimate 'Roy of the Rovers' story. Allen, who was then in Swansea's centre of excellence, largely owes his career to the former Wales under-21 striker who deserves his "enjoyable watching brief" in Monday's Championship play-off final against Reading. If it was not for Thomas' treble and the subsequent Swans escape act, the Welsh club was in danger of folding altogether, let alone losing its youth set-up. Thomas, now an ambulance driver in nearby Port Talbot after a knee injury forced his retirement from football, will take Allen's seat in the stands as he hopes to cheer Brendan Rodgers' team into the Premier League. "It is scary to think how things could have turned out if we had not won that game," said Allen. "We all feared what would happen to the club and the centre of excellence if things went wrong. 2001/02: Rescued from brink of collapse. Captain Nick Cusack replaced manager Colin Addison. 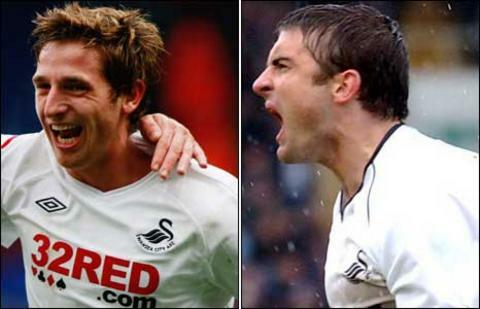 2002/03: Cusack sacked, Brian Flynn kept Swansea in the Football League. 2003/04: Kenny Jackett replaced Brian Flynn. 2004/05: Promoted to League One in Jackett's first full season in as a manager. 2005/06: Lost to Barnsley on penalties in League One play-off final. Won Football League trophy. 2006/07: Jackett replaced by ex-captain Roberto Martinez. 2007/08: Martinez's first full season as a manager ends with promotion to the Championship after 24-year wait. 2008/09: Missed out on play-offs by six points. Knocked FA Cup holders Portsmouth out in fourth round. Martinez left to take over at Wigan. 2009/10: Paulo Sousa guided Swansea to within a point of the play-offs in his one season in charge before leaving for Leicester City. 2010/11: Finish third and reached play-off final in Brendan Rodgers' first full season as a manager. "That fear that the club could fall into oblivion spread down throughout the club, even down to us in the under-13s team. "It was an incredible anxiety in the crowd, I can't imagine what it was like in the changing room. "We went 2-1 down to Hull and that was at an all-time low, we did feel doomed. However, there was optimism in the crowd that could have turned sour. "Thankfully James Thomas popped up with a hat-trick and we are all here because of that." Thomas' second penalty - a second "dubious" spotkick - restored half-time parity, equalising two Swans defensive howlers that allowed Stuart Elliott and Martin Reeves to give Hull an early lead. "That dubious penalty just before half-time was a big turning point as it was a psychological boost going in the interval level," recalled Thomas. "I tried to flick the ball around the centre-half and he didn't know much about it and under pressure from the North Bank, the referee gave a penalty. "I knew the signifcance of the second and I really felt the pressure. It wasn't a good penalty at all but it went in and that was the main thing - and the club hasn't looked back since." Lenny Johnrose's strike and Thomas' third saved Swansea's Football League status. Current stalwarts Leon Britton and Alan Tate have played key roles - and their transformation from brink of non-league to verge of Premier League inside eight years has been described by boss Rodgers as a "footballing fairytale." A fans consortium saved the struggling club and four managers, two promotions and a new stadium later, Swansea have a Wembley date with Reading in the Championship play-off final for a shot at the £90m Premier League jackpot that once seemed a world away. "That Hull game is a moment in time that I will never forget," said 21-year-old Allen, who was been at Swansea since the age of nine. "And the highs of reaching the play-off final are so amazing because the lows of our dark days were so bleak. "The play-off final will be a different type of pressure as we are trying to take advantage of excitement rather than fear. "But the story and emotions won't be enough to win us promotion the spirit of 2003 can inspire us - and if we take our A-game to Wembley, it should be enough." Swansea's only previous top-flight promotion - when their journey from bottom to top division took just four years - was secured at Preston North End in 1981. But this adventure from Hull and back could be Swansea's most epic "magic carpet ride" - as Rodgers so delicately put it - if Premier League promotion triumph is clinched under Wembley's arch. "I won't be thinking about the part I played," said Thomas. "I'll just watch from the stands like any other fan on a day out with their mates. But I am honoured to feel that I may have helped, albeit a little bit."